NATURAL HABITAT AND PREFERRED SITE: Native to China, Korea and Japan but adapts well in Texas to a variety of soils if they are well-drained. Needs full sun. 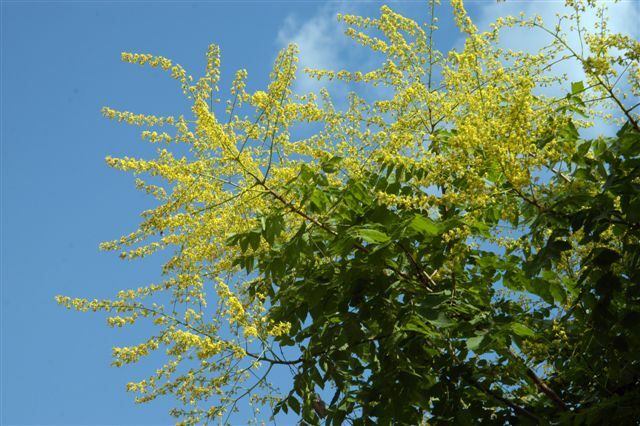 IDENTIFICATION INFORMATION: Upright, open-branching shade tree that has beautiful yellow flowers in the early summer and distinctive seed pods in the fall. It is deciduous with yellow fall color. It typically has a compact rounded head. FLOWERS AND FRUIT: Bright yellow flowers in large terminal clusters in the late spring to early summer, May to June, covering the entire tree. Each flower is about ½ inch in diameter with orange markings at the base. Flowers are followed by decorative and distinctive seed pods that are shown in the photograph. They are paper walled, bladder-like or lantern-like capsules 1 to 2 inches long. Seed pods are light yellow brown at first changing to reddish brown and persisting into the winter refers to the fruit capsules. Each contain 3 round black seeds about a ¼ of an inch in diameter. BARK: Bark ranges from a silvery-gray color to a grayish- brown. It is fairly smooth when young but the texture becomes more coarse with age. FOLIAGE: Leaves are alternate, compound, 8-14 inches long, composed of 7 to 17 leaflets and medium green to almost blue green on top with a lighter green below. Leaves drop early in the fall after turning a moderately interesting yellow to yellow-orange fall color. 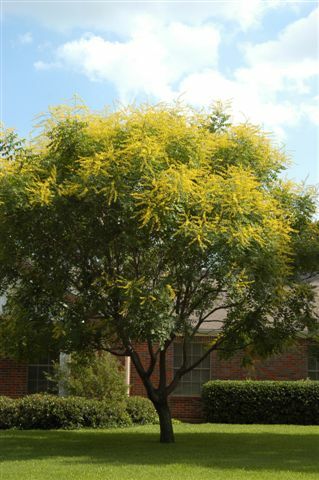 CULTURE: Golden raintree if easy to grow in moderately moist and well-drained soil. It does not need heavy fertilization. It is susceptible to some root diseases but those can be easily overcome with the Basic Organic Program and problems that pop up can be cured with the Sick Tree Treatment. Decorative late summer seed pods. PROBLEMS: Few other than the relatively short life and diseases if not growing in healthy soil. PROPAGATION: Done by seed primarily. 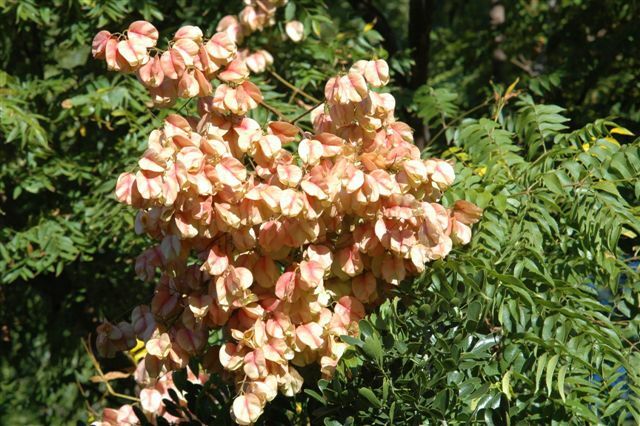 INSIGHT: Koelreuteria bipinnata is a close kin but not as cold hearty as K. pinniculata and not recommended for the northern half of the state. 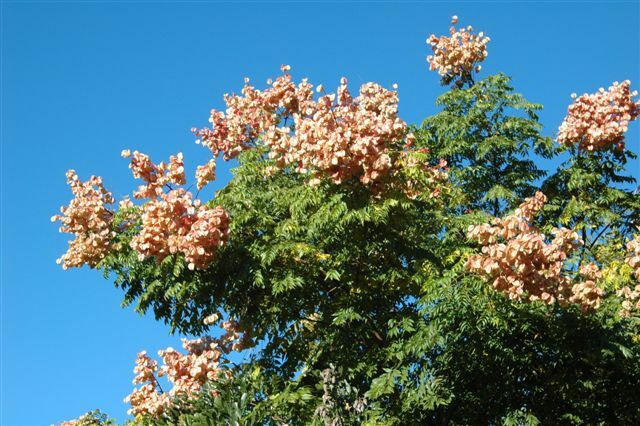 It grows much larger at 40 to 60 feet in height, has twice compound leaves and blooms in August with a salmon pink to orange pink fruit somewhat larger than that of K. pinniculata. Decorative late summer seed pods.